A guide to choosing a solar water pump for remote (off-grid) applications, like this one, has been published by ARS agricultural engineer Brian Vick and colleagues. 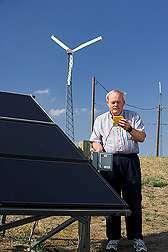 (PhysOrg.com) -- A guide to choosing a solar water pump for remote (off-grid) applications has been published by Agricultural Research Service (ARS) scientists. For this guide, agricultural engineer Brian Vick and colleagues drew on the ARS Conservation and Production Research Laboratory’s 31 years of testing stand-alone water pumps. The laboratory is located near Bushland, Texas. Vick found that for pumps with motors rated less than 1,500 watts, solar is usually the best choice. With current technology and costs, wind power or a hybrid wind/solar pump is usually best for power needs of 1,500 watts or more. Vick and colleagues tested three major pump types: diaphragm, helical and centrifugal. Diaphragm and helical pumps can maintain almost the same maximum flow rate over a large range of pumping depths. Because maximum flow rate increases with increasing power, centrifugal pumps can pump more water than diaphragm or helical pumps, although a photovoltaic (PV) array rated at a higher power may be required, especially at deeper pumping depths. Powered with a 160-watt PV array, most diaphragm pumps sold today can draw sufficient water from wells 100 feet deep or less to supply 75 head of cattle. Some recently designed diaphragm pumps can draw from as deep as 230 feet, but can only supply sufficient quantities of water for 30 head of cattle. ARS research indicates that if more water is needed or a deeper well is required, a pump type other than a diaphragm—and a PV array of more than 160 watts—is recommended. The researchers also recommend using a controller on all pumps. For irrigation, they recommend the centrifugal pump with a hybrid wind/solar power system. Their guide offers case studies in the Bushland area, where wells are more than 230 feet deep. One example is a four-person household, for which they recommend a helical pump powered by a 500-watt PV array. To supply water to 150 head of beef cattle, they would use a helical pump powered by a 640 watt PV array. The guide, published by the American Solar Energy Society in 2009, is available online.